Almost half of US mobile subscribers have smartphones at the end of February 2012 as smartphone adoption continues its steady growth, according to the latest study by Nielsen. Smartphones are now nearly as popular as feature phones in the US - 49.7% of mobile subscribers owe a smartphone and by the end of March this should have already changed and more subscribers would have a smartphone rather than a feature phone. More than two thirds of buyers chose a smartphone over feature phones in the last three months. To put the US smartphone growth in perspective, only 38% of users had a smartphone in February last year. Interestingly, iOS continued its march to the top and almost closed the gap on Android. Google’s platform was still the most popular operating system stateside with a market share of 48%, but Apple’s iOS trailed with 32%. And if we look at the last three months alone, Apple’s share has grown to 43%. BlackBerry is a distant third commanding 12% of the US market. After seeing the charts i must salute Android. Well hold those salutes for the iOS, because the new batches of Androids are being built just like an iPhone, with no removable battery, no expansion slots. Main reason why Android is king of the hill right now. But not for long. I know for me I love my Android because I hated iPhone with no expansion slot or removable battery. But I hate to say this if this is the new trend for Android. Well it's a no brainer, I will go onto the better ecosystem Apple. As a Mac owner as many other Android user that own Macs, will be doing the same if this is going to be the only option in smartphone with no expansion slots or removable battery. I haven't noticed a trend of no micro sd card though. Battery might be, but as long as it lasts as the Razr Maxx does I'm ok with that. Well then you have been reading up on most of the upcoming phone then. It's a TREND, that I am HATING! If you love it great, you walk around with your plus, But for me I want to just have in my pocket an extra battery. I travel very very lite. No hand bag for me, no backpack for me no nothing. Super Lite..
Thats the thing. How many Android users are Mac users? I think Windows PC's are dominating in marketshare. Ecosystem does play a part. For those who dont have a mac and have an Android phone...I cant see too many switching. Those heavy in the Apple or Android ecosystems right now will more than likely stay there. And I dont think removable batteries and sd cards are the main why Android is doing so well...lol Main reason is choice, and a decent product. Choice other than a iPhone and better price than iPhone, so yes I agree. But now those choice are going by the waste side. Because the Android are becoming like iCrap iPhone in price and choice in specs. I agree, I only talking about Mac user with Android, not Window, If I had window, Yeah I would stay with Android. So you are right, But a wave will change up to iCrap iPhone is they were force to chose same device with same specs. Will at that point be to chose an ecosystem that make sense for a Mac user. Nothing personal, but I don't think having a removable battery is high on the list of most consumers out there, iPhone or Android. Expansion slots may be higher, but they're still very prevalent anyways. I agree, seem to me most consumers really enjoy running around like headless chicken looking for an outlet. I'm sure that is 1 on their list of requirement when looking for a new phone. No need to get sarcastic, sir. Also, how does having a removable battery prevent people from, as you bluntly put it, "running around like headless chicken looking for an outlet?" I'm pretty sure most people would rather plug their phone in every once in a while than carry an extra battery around with them wherever they go. I'm not saying that having an extra battery doesn't have its advantages, but Android users I know, including myself, don't really care about this (and I'm using an Evo 4g, so if anyone should care, it would be me.) Whether it's better to have an extra battery or not isn't the issue, it's whether having a removable battery is a real-world advantage that tens of millions of American Android users currently consider a deal-breaker. Obviously my observations could be skewed by the types of people I associate with, economic conditions, etc., but I just don't think having a removable battery is that big of an issue for the vast majority of people at this point. @Commentor: Seems to me after looking at your profile, you and I have lots in common as far as gadgets are concern. Everything on your list, I to like, want or had. So you have great taste. Thanks, and I do agree with you that Android manufacturers should be looking to differentiate their features from the iPhone, not compete directly. I think the ASUS PadFone is the best thing to happen to Android in quite some time, simply because it's so different from the iPhone and markets to a completely different segment. That's what companies should be doing, in my opinion. I was really hoping the padfone would be a big seller. Has it even come out yet? The concept is so easy, yet genius. Its basically just like an HDMI out to a portable screen that holds the device for you. With phones getting so powerful, it really does make sense. ASUS is planning to release the PadFone sometime in April, and is expected to release it first in Taiwan, then elsewhere. I hope, and this is just speculation, that it hits the States sometime in May/June, like they did with the Transformer last year. I also hope it comes to Sprint. Given Sprint's track-record with unconventional devices, such as the Kyocera Echo, Evo 3D, and Samsung Replenish, they might spring for the PadFone. However, none of those devices really lived up to expectations, so Sprint may unfortunately have reservations about picking up the PadFone (once bitten, twice shy, after all.) T-Mobile would also be a good option, though, as it already supports their bands (I believe), and T-Mo hasn't really announced anything big this year, other than the One S, even though it literally has the exact same specifications that the PadFone has, sans tablet dock. It's pretty much a foregone conclusion that Verizon won't pick it up, as they seem to be the most mainstream carrier there is. I wouldn't bet on AT&T either. AMERICAN citazen's are loyal to APPLE but, APPLE is perfidious to AMERICANS!!!!! It does seem that way as we have seen Apple sales dwindle an awful lot in our stores over last few years to where we have android hansets now outselling iphone handsets at least 5:1. It seems alot of people are becoming pro-choice instead of being spoon fed what they are told they want by apple. Unfortunately in America maybe influenced by patriotic values or perhaps due to the more mass pr advertising and mass targetting by apple alot more Americans fall for apples this is cool,this is what you need strategy. that many people are still buying blackberry? bet 11 of the 12% are business. So if half the american population has a smartphone, and half of those phones are android, that means 25% of everyone in the US is rockin an android set of some sort. 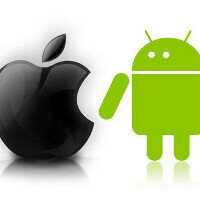 iOS's growth is good, but androids is still stronger. Many android people are holding off on upgrades right now with the OneS/OneX/SGS3 right around the corner. Because of that, I'd expect a paradigm shift back to heavier android adoption after their launches. I'd also expect WP7 to be out of the "other" category and be classified on its own by christmas with the high profile nokia launches. The same can be said when the iPhone 5 comes out as well. Their are newer android devices out the the newest iOS device the 4S. yup. its a continual paradigm shift. When the spring rolls out the new hit android devices, there is a heavy shift to android market share, when the new iphone launches, it shifts towards apple. The only 2 consistants are that, and that android has been still beating iOS in total sales, even when the new iphones come out. iphones sell a ton, but the value of choice still rules the roost. i know some think im nutty, but i still think WP7 is going to cut into future iOS sales more than android sales. Its going after gamer teens and those that want an easy curated experience because they are not tech savy, which are 2 of apple's biggest segments. I would say wp7 sales are tough to predict but its not like market share really matters anyway. I don't buy a phone based on what others are getting I get whats best suited for my needs. I think the whole debate is silly. But if you did want to have the debate then yes android is ahead of iOS. Numbers are easily skewed though because if you wan't to look an individual phone sales it goes to the iPhone. Or you could go by region which some android some iOS others bada is a relevant player as well. Its not like numbers hold much significance anyway. Android users might be more willing to try WP7 than an apple user, sure. Android users like choice. My point was that its not going to "take away" a large chunk of current apple users, its going to take away a large chunk of POTENTIAL apple users. Only half of those with cell phones, have a smart phone, so there is a huuuuge chunk of people to go after. WP7 has a very similar curated and easy experience to Apple, with some of the benefits of android like widgets and minor modding. Thus its going to appeal more to the mindset of those that might like apple, than those that might like android for an initial purchase. It WILL take from both sides, I just think its going to hit potential apple customer sales a bit harder. Bio, The ONLY stats that matter are total OS sales. Individual phone sales mean squat except in a fanboy mud fight. Total OS sales drive word of mouth marketing, app development, and all sorts of junk. What do total phone sales drive, except for the manufacturer to want to make a sequel device? If company A sells 20 million of 1 phone, and company B sells 3 million of each phone, but has 10 different phones to sell (all with the same OS), who is doing better? Individual sales mean nothing. Well Android has more market share but ios has more app developer support, more effective marketing, and a higher degree of brand recoqnition and subsequently more word of mouthgenerated by new product released. When the 4S came and and new ipad both were talked about on the news/talk shows. Android doesn't usually have that. So what significance does market share really have. If you want tol talk about app devolpment talk about that I don't see why market share is relevant. those reports on app developers are crap. If there was really an issue, the android market wouldnt have spiked past 500k apps this year and growing. Its almost completely caught up to iphone's app market... which means its still growing faster than the iphone app market. I have used both ecosystems and what I found was the apps r good on both but the app store is just better. Apps come quicker to ios like cut the rope, temple run, nba jam. Number of apps doesn't mean much because I feel the quality is better.